Parents scold their children to correct their behavior, hoping that their offspring will discontinue their misbehavior as a result. What's paradoxical about this kind of punishment is that it can have the opposite effect. There are many explanations for this finding that motivation through punishment may not work. The best explanation in my experience is that negative attention is better than no attention at all. Even though the punishment may be uncomfortable there is what is called "secondary gain" meaning that beyond the negative experience produced there is a positive one. 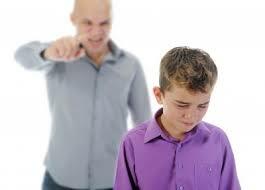 So while the scolding or other hurtful punishment is somewhat painful, the reward of the parent's attention and engagement is positive enough to offset whatever negative experience was inflicted. Punishment, also, is not enough to correct behavior and repair harm that has been done by the mistake without offering the child at least one alternative behavior.